Madame Séraphine Pajaud could always count on having plenty of women in her audience; she even told me that if there were as many anarchist women as men, the social revolution would have operated already, because women are less selfish, less cowardly and more ready for sacrifices than men. Article in Le Revue Mondiale, 1904. Julie Louise Pajaud was born in 1858 in the Charentes-Maritimes department of France. She appears to have substituted Séraphine as a first name when she became an anarchist. She lived with the anarchist Marie-Georges Sandré and a police report of 25th June 1898 describes their relationship and that they had a son. She became an active anarchist propagandist and make frequent speaking tours. At the time the Dreyfus Affair which began in 1894 and rumbled on until its resolution in 1906 coincided with a wave of anti-clerical agitation by Radicals, socialists and anarchists which culminated in the separation of Church and State in 1905. 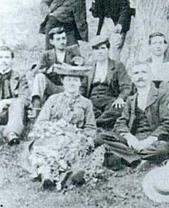 Pajaud was one of those anarchists who actively participated in this social ferment. In 1899 she gave a series of meetings in Limoges, then moving on to speak at the nearby town of St Junien, which was in the process of becoming a stronghold of anarchism. On February 17th 1900 she spoke at Moulins at a meeting with the following themes: "The truth to the people – There is no God- Ways and means to achieve complete emancipation – the positions of Anarchists vis a vis capitalism, nationalism and anti-Semitism “. She spoke in the mining area in northern France in March of that year, where she introduced the mining communities to radical ideas like birth control, free love and the place of women in society. These then advanced ideas for the time did not appear to have acted as a deterrent, as she had crowds of around 250 at Autun, Le Creusot and Montceau, the same number as other socialist and anarchist speakers. In February-March 1901 she toured western France, visiting Le Mans, Brest, Morlaix, and Rennes. The same year she spoke to the freethought societies of Lens and Hénin-Liétard. She conducted a trial of God, denounced the “clerical sore” and distributed a tract by the German anarchist Johann Most entitled The Religious Plague. On the 1st March 1902, following a conference on "the non-existence of God", she was convicted in absentia by the Criminal Court of Boulogne-sur-Mer to 6 months in prison and a fine of 100 francs for "incitement to murder, looting and burning." In 1904 she participated in a new lecture tour. She was now based in the Isle of Ré, Sandré having now died. She returned to St Junien in June to give another speech at a crowded meeting. Speaking in Bressuire in the department of Deux Sevres on the 11th September, she began her lecture with an attack against God. "God does not exist, cannot exist, we are now far from the idea of God”, and continued to wild applause:" How can it be argued, citizens, that this so good and flawless being allows a heap of meanness and a heap of atrocities to be committed on earth? How is it that he can be so unjust as to let proletarians die of hunger, whilst the bourgeois and the capitalists die of indigestion? At Louviers on 25th 1905 she addressed a meeting of 300, which included fifty women who were given free entry, men paying thirty centimes. She was there at the invitation of an anti-clerical society, set up three months before. The theme of the meeting was The Non-Existence of God and ended with a mass singing of The Internationale. In October of that year she presented a number of anti-war meetings in the Allier department including at Montlucon, Commentry, Desertines and Domerat which had been organised by local anarchist groups. The meeting at Montlucon, on October 20th, according to a local police report, had the following theme “War is a crime, desertion in an inconsequence, revolutionary government is a stupidity”. It had an audience of around fifty people. She also mentioned the recent arrest of the anarchist Louis Grandidier and announced the opening of a defence fund. The following day at Commentry she called the Army a school of vice and defender of the strongboxes of the bourgeoisie, called the officer class bandits and assassins, incited to desertion and called for anti-militarist propaganda in the barracks, ending up by calling for the suppression of the Armies, countries, and governments “even” revolutionary ones ( according to another police report). The meeting ended up with the singing of the anarchist song Supprimons les Patries (Suppress Countries). After the law of the Separation of State and Churches was passed on 5th December 1905, she toured the Perigord. At Montignac sur Vézère she was cheered by a crowd of one thousand, whilst at Saint Léon-sur Vézère, women banging cooking pots and saucepans welcomed her. In 1906 she was arrested in Ales in the Gard in southern France for the double charge of “apology for crime” and “insulting the army." Martial Desmoulins, who mistakenly gives her the first name Amélie, recounted how he met her at the home of a friend the Jewish anarchist Alexandre Jacob in Nice at the beginning of the 1930s. Sebastien Faure, another anarchist veteran came down on a visit, and the pair recounted their memories according to Desmoulins. She arranged her meetings from town to town “often not having enough money to go to a hotel and take the train, sleeping in barns and going on the tramp”. She had visited every department in France bar two. She had welcomed the birth of the CGT with wonder, had taken part in its birth and organisation, and had then believed that the revolution was days and months away. Desmoulins went on to say that she retired to her home area of Charentes-Maritimes in 1934 and indeed the anarchist Andre Lorulot ran into her at La Rochelle in that year.